Configuring a camera to obtain an IP address will enable it to get an IP address automatically from a DHCP server. Assigning a static IP address on the camera is very useful especially if you want to access it remotely. This can also prevent IP address conflicts on your network. This article will guide you on how to configure the IP address for your camera. Open a web browser like Internet Explorer then enter the camera's IP address in the Address bar. NOTE: To know the IP address of your camera, click here. Enter your camera’s User name and Password then click OK. NOTE: The default User name and Password is admin. 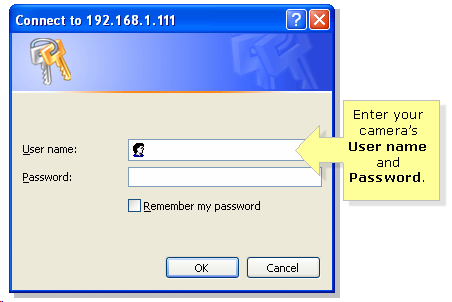 However, if you have changed the User name and Password during the initial setup, you need to use them instead. 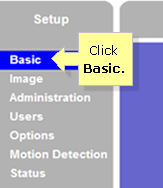 Click Basic located at the left side of the page. 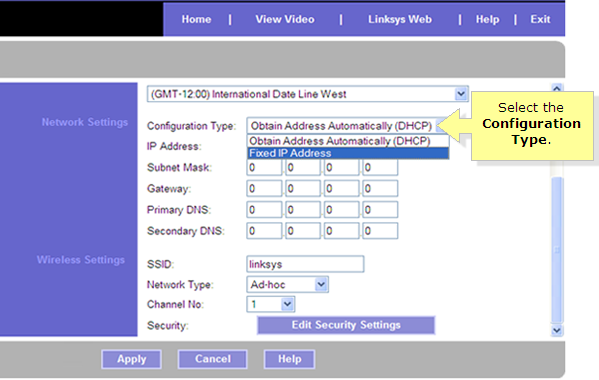 • Fixed IP Address – specific IP Address, Subnet Mask, Gateway, Primary DNS and Secondary DNS are set on the camera. Make sure that the IP Address that you will be assigning to the camera has the same first three (3) set of numbers as of the Default Gateway. The Default Gateway is the IP address of the router. For instructions on getting the default gateway’s IP address, click here. The Primary DNS and Secondary DNS should be the same with your network. For instructions in getting the DNS for your network, click here.